There is a fair amount of confusion about tax implication for NRIs who want to sell any house property that they may have in India. This article explores how much tax is payable and TDS deductible in case of NRIs who want to sell property in India. NRIs who are selling house property which is situated in India have to pay tax on the Capital Gains. The tax that is payable on the gains depends on whether it’s a short term or a long term capital gains. When a house property is sold, after a period of 2 years (Reduced from 3 years to 2 years in Budget 2017) from the date it was owned – there is a long term capital gain. In case it held for 2 years or less – there is a short term capital gain. Tax implications for NRIs are also applicable in the case of inheritance. In case the property has been inherited, remember to consider the date of purchase of the original owner for calculating whether it’s a long term or a short term capital gain. In such a case the cost of the property shall be the cost to the previous owner. Long term capital gains are taxed at 20% and short term gains shall be taxed at the applicable income tax slab rates for the NRI based on the total income which is taxable in India for the NRI. When an NRI sells property, the buyer is liable to deduct TDS @ 20%. In case the property has been sold before 2 years(reduced from the date of purchase) a TDS of 30% shall be applicable. How to save tax on capital gains? NRIs are allowed to claim exemptions under section 54 and Section 54EC on long term capital gains from sale of house property in India. It is available when there is a long term capital gain on sale of a house property of the NRI. The house property may be self occupied or let out. Please note – you do not have to invest the entire sale receipt, but the amount of capital gains. Of course, your purchase price of the new property may be higher than the amount of capital gains. 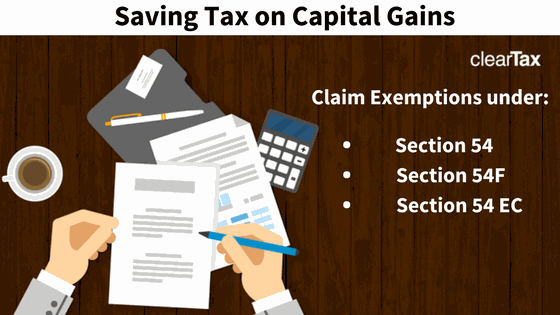 However, your exemption shall be limited to the total capital gain on sale. Also, you can purchase this property either one year before the sale or 2 years after the sale of your property. You are also allowed to invest the gains in the construction of a property, but construction must be completed within 3 years from the date of sale. In the Budget for 2014-15, it has been clarified that only ONE house property can be purchased or constructed from the capital gains to claim this exemption. Also starting assessment year 2015-16 (or financial year 2014-15) it is mandatory that this new house property must be situated in India. The exemption under section 54 shall not be available for properties bought or constructed outside India to claim this exemption. (Do remember that this exemption can be taken back if you sell this new property within 3 years of its purchase). If you have not been able to invest your capital gains until the date of filing of return (usually 31st July) of the financial year in which you have sold your property, you are allowed to deposit your gains in a PSU bank or other banks as per the Capital Gains Account Scheme, 1988. And in your return claim this as an exemption from your capital gains, you don’t have to pay tax on it. It is available when there is a long term capital gain on the sale of any capital asset other than a residential house property. To claim this exemption, the NRI has to purchase one house property, within one year before the date of transfer or 2 years after the date of transfer or construct one house property within 3 years after the date of transfer of the capital asset. This new house property must be situated in India and should not be sold within 3 years of its purchase or construction. Also, the NRI should not own more than one house property (besides the new house) and nor should the NRI purchase within a period of 2 years or construct within a period of 3 years any other residential house. Here the entire sale receipts are required to be invested. If the entire sale receipts are invested then the capital gains are fully exempt otherwise the exemption is allowed proportionately. If you can save the tax on your long term capital gains by investing them in certain bonds. Bonds issued by the National Highway Authority of India (NHAI) or Rural Electrification Corporation (REC) have been specified for this purpose. These are redeemable after 3 years and must not be sold before the lapse of 3 years from the date of sale of the house property. Note that you cannot claim this investment under any other deduction. You are allowed a period of 6 months to invest in these bonds – though to be able to claim this exemption, you will have to invest before the return filing date. The Budget for 2014 has specified that you are allowed to invest a maximum of Rs 50 lakhs in a financial year in these bonds. The NRI must make these investments and show relevant proofs to the Buyer – to make sure TDS is not deducted on the capital gains. The NRI can also claim excess TDS deducted at the time of return filing and claim a refund.